Ancient Frog is a meditative puzzle game from Ancient Workshop with beautiful imagery and a serene soundtrack that’s as unusual to play as it is to describe. This Isn’t Frogger: In Ancient Frog, you try to get a frog from one end of a leaf to the other in the proscribed number of moves. It’s calming and entertaining fun. Unlike many puzzle games, Ancient Frog feels like it’s rooting for you to win. And I use the term “win” here loosely: a key aim of the game is to help you relax and mellow out, and it performs quite well in that regard. Solving each of the 100 puzzles is fun, but the appeal of the $5 game would suffer without the overall mood. You control an unusually flexible, beautifully rendered frog, who’s standing on a similarly intricate leaf. You must move him, one webbed appendage at a time, so that he can eventually reach—and eat—the delicious fly waiting at the far end of the leaf. Your froggy feet may only be placed in certain places on the leaf, and they’re not all always available. Although the frog is stretchy, he’s not Gumby: As you tap and hold on a foot, a light highlight shows which spots (if any) that foot can currently reach. Your goal is to find the shortest path of leg-stretching to reach the indicated final position for optimal fly swallowing. But as I said, Ancient Frog is a peaceful game. Take as long as you need on each new level, because there are no time limits. Although each level has a “par” suggestion for how many steps it can be completed in, you’re welcome to take as many steps as you need to get it done. You can always take a move back—swipe across the screen to the left to undo and to the right to redo. If you find the current level too stressful, tap the daisy in the upper-right corner to skip it. Oh yes, the daisy. Besides the frog itself, the daisy is the only other tappable surface on the main gameplay screen. The daisy shows how many steps you’ve taken and the par level. When you spend a long time on one level and take many steps, the sole impact you’ll note is that petals from the daisy drift down across the screen. No lives are lost, no penalties assessed; just the oddly calming sight of petals drifting away. Early on in Ancient Frog, the difficulty is pretty minimal. As you progress through the initial levels, strategy begins to play a larger role to reach the fly. Trickier levels might even start to annoy you a bit if you can’t figure out how the heck to get the frog’s body parts in the right position. As zen-like as the game strives to be, I still found that vexing levels got under my skin—around my 25th step on Level 8 (Par 15). Ah, but drag the rear left foot here, and—Yes! The moment you realize that victory is literally within reach might not be achieving nirvana, but it may be as close as an iPhone game can get. The game’s unique main menu uses flora to show all the 100 available levels; green flowers represent that you met or beat par, and red flowers indicate that you play more like me. All levels are unlocked and playable from the get-go. Also worth noting: When you first launch Ancient Frog, the game plays an excellent, full-screen video tutorial, complete with finger, showing you to play. And Ancient Workshop offers Ancient Frog LE, essentially a demo for the $5 app. Ancient Frog is lovely. It’s both calming and entertaining, and entirely enjoyable. 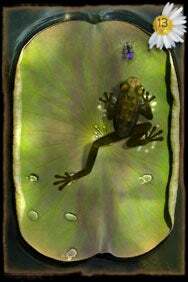 Ancient Frog is compatible with any iPhone or iPod touch running the iPhone 2.x software update.